OMG, I fell in love with Snowmass, Colorado. 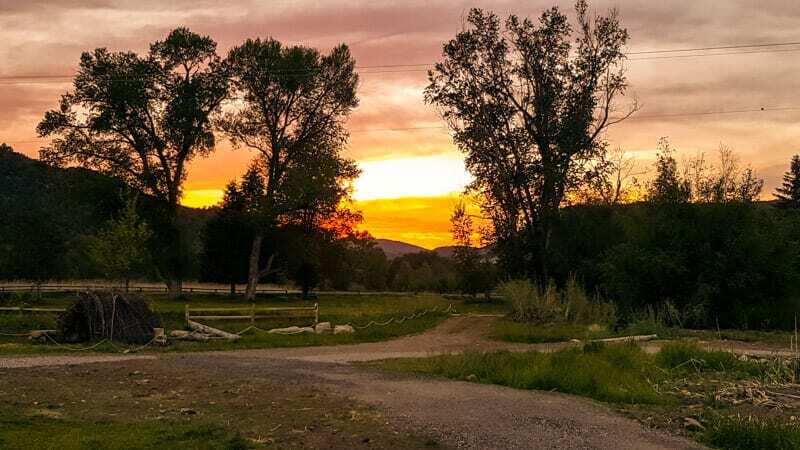 It was the vision I’ve had for years of my perfect mountain town appeared for me – warm, friendly, homegrown, small-town, perfect for families, unpretentious, with plenty to do. 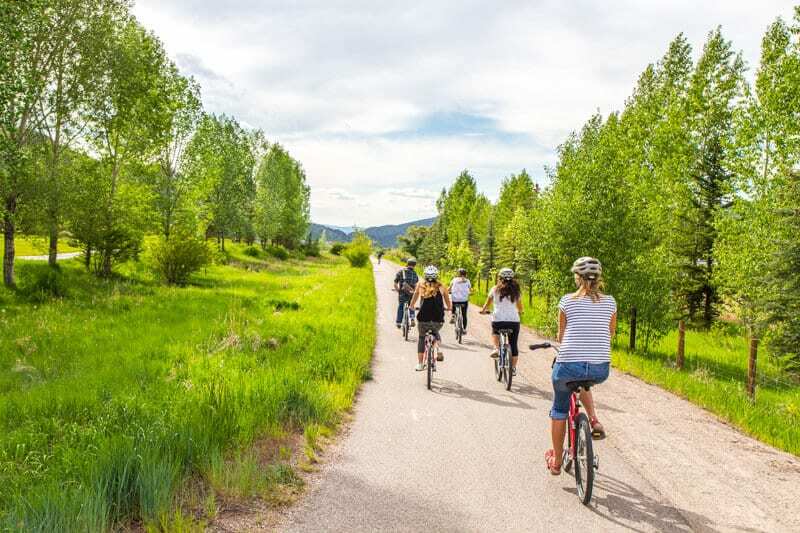 We were in Snowmass to attend the first ever Travel Influencers Summit and I quickly realized when I arrived why my Aussie friend, Kimmi fell in love with the town. 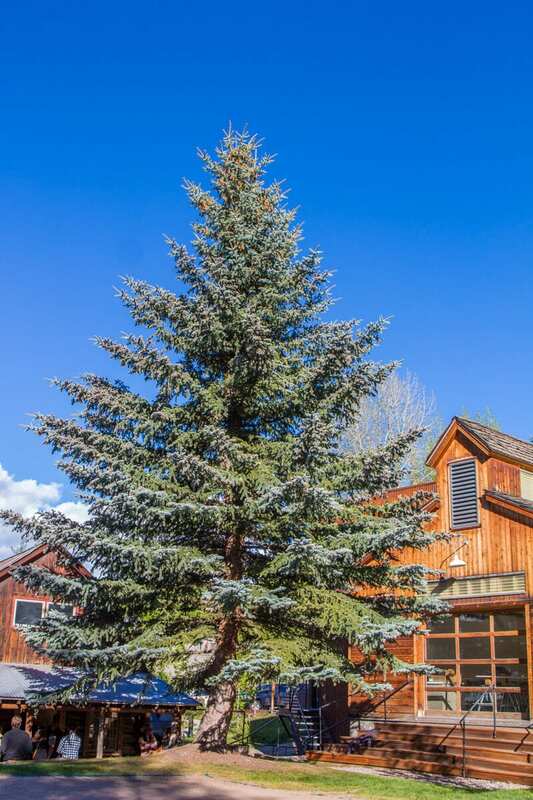 She lived there for several years working on the Snowmass Ski fields. We discovered in Snowmass that it’s the most popular place for Australians to go skiing in Colorado, and possibly the US. We’re planning on going back to Snowmass for some time on our US road trip, in the summer, and in the winter. It’s always been my dream to have a white Christmas in Colorado; I’m hoping this year will be the dream come true moment. We stayed in Snowmass for three nights for the Summit, which was hosted by Snowmass Tourism and organised by Gary Arndt. We were busy in meetings for the two days and so didn’t even explore Snowmass in depth, but what I saw was enough to make me love it. We don’t have mountains in Australia so being in the Rocky Mountains is like walking into fairy tale land. It’s mesmerizing and awe inspiring, and I feel giddy each time I gaze at the snow covered jagged peaks. If you’re used to it, you might not get the same champagne buzz that I do. Combine that with the colours of the bright blue sky, the alpine trees, the lush greenery and the rapidy rivers; I’m in total heaven. Get me out rolling amongst those wildflowers in bloom! I was so excited to meet finally in person, travel blogging friends I’ve only ever interacted online with for years. Dave and Deb from The Planet D, Laurence and Jess from Finding the Universe and Mike from Vagabondish were just as awesome in real life. These guys were some of the first people we ever met in the travel blogging land. My Aussie Instagram friend Lauren Bath was with us, and Matt Karsten from Expert Vagabond and Chris Christenson from Amateur Travel Podcast, who we met last year at the White House trip. I made some cool new friends that I’ve only met in passing online, Johnny Jet, the man who knows everything about flying; Kevin O’Leary, husband and manager of Samantha Brown from the Travel Channel; Gary Arndt from Everything Everywhere who I hung out with years ago in Sydney. Totally awesome people who we learned so much from and had fun getting to know, especially over a few late night cocktails made by the award winning bartender, Justin at the Viceroy. Tell him we sent you for a Moscow Mule! 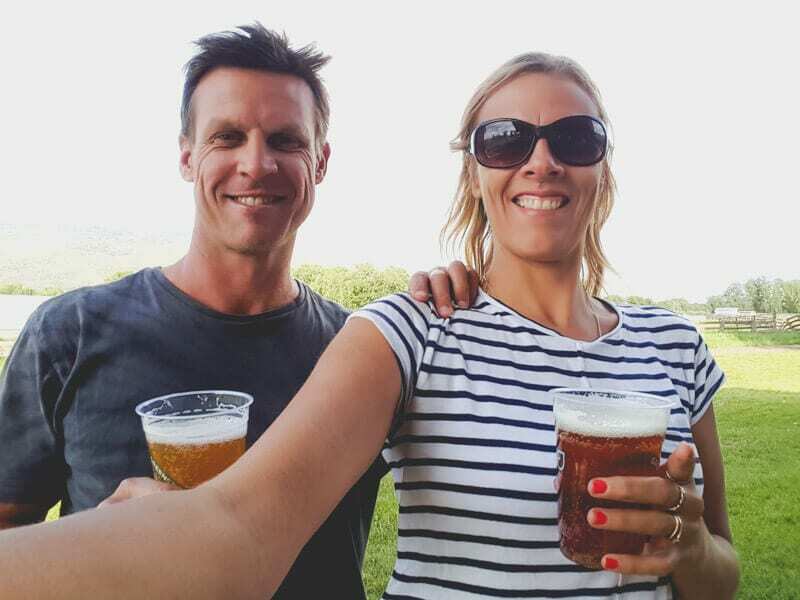 If I have one word of advice to you when visiting Snowmass, is never underestimate the effect the high altitude can have on your body when you drink alcohol. I woke up after our first-night meet and greet with the worst hangover ever. I didn’t even drink much and was in bed fairly early. I felt disgusting! Not the way you want to kickstart your conference. A good tip Johnny Jet told us after the first evening was to always sleep with a humidifier on in high altitude places. They tend to hide them in the cupboard of your room (ahh that’s what that thing was), if not, always ask the front desk as they should have one to give to you. It made a big difference to our sleep for the next two nights. 20 miles sounds like a long bike ride when your popping on the helmet, but when the gradient is slightly downhill, it’s quite quick and effortless. Thank goodness we did not have to return by bike. We had a bus to drive us back after a few campfire beers. 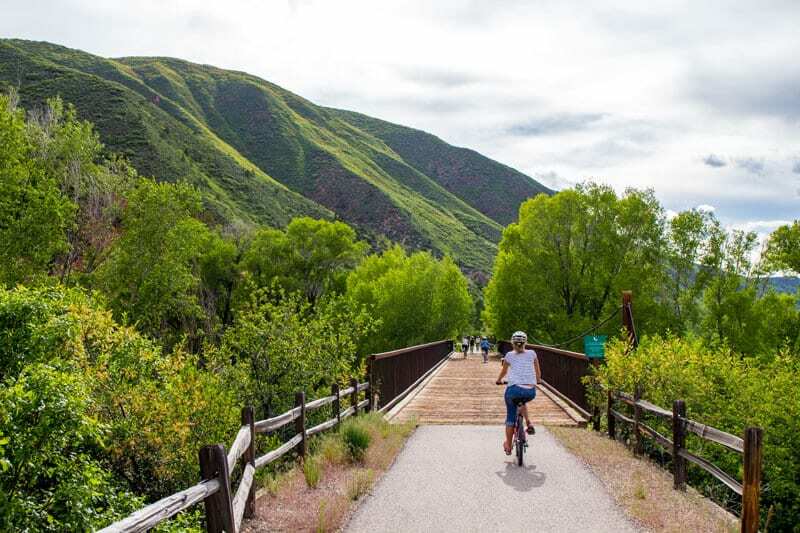 Blazing Adventures took us along the Rio Grande Trail, which follows the region’s historic old rail line, extends over 80 miles between Aspen and Glenwood Springs. 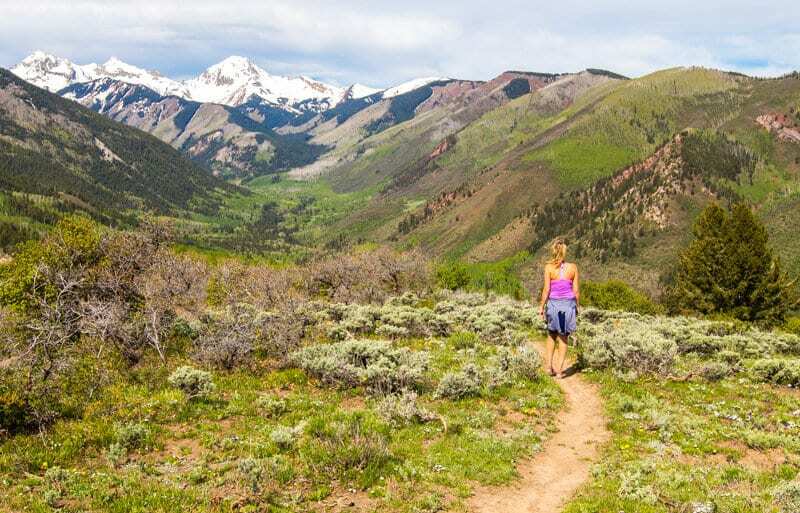 It followed the Roaring Fork River through the valley and offered incredible mountain views. I even saw a deer peeking at us from behind a tree. 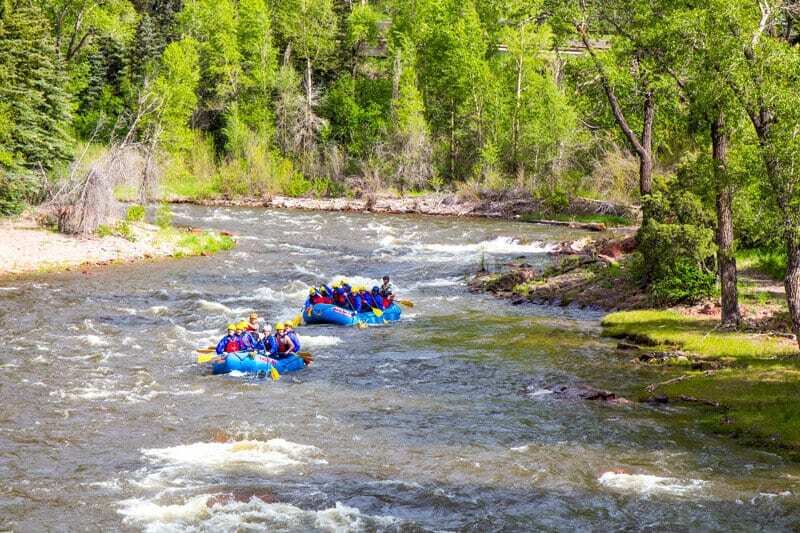 Half of our crew decided to do the white water rafting with Blazing Adventures along the Roaring Fork. We managed to find a clearing beside the road to spy on them. I was gutted at first when they said the rapids were grade 4 as I would have chosen to do that one. It turned out they were a bit more sedate, and no one fell overboard, so I was happy with my relaxing bike ride. We’ll be back to do those rapids another day. Colorado Rockies. BBQ. Craft Beer. Fire. Lassoing demonstration. Can you have a better experience in Colorado? 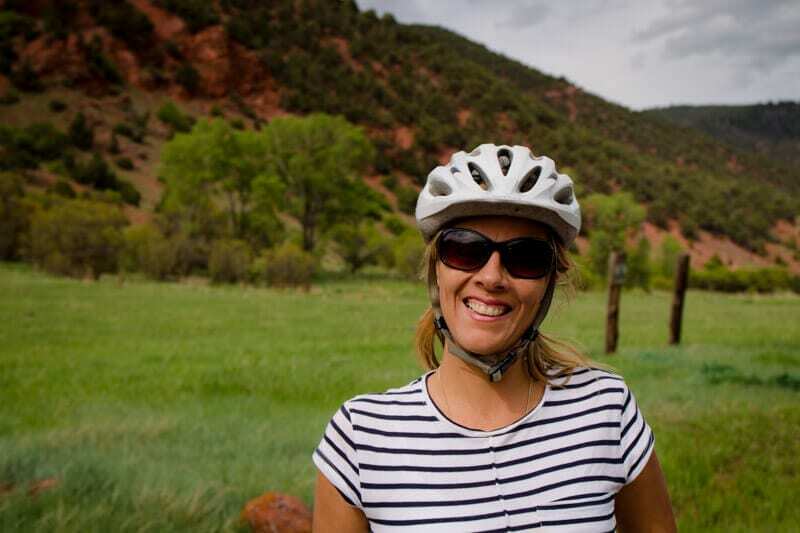 The bike ride and white water rafting finished at Rock Bottom Ranch, an 113-acre wildlife preserve. Rock Bottom Ranch is a working farm where educational programs take place. Families can take farmyard tours (complete with goats, pigs, chickens, and ponies), sit down for a picnic, and then pick up sustainable agricultural products before heading home. We’re looking forward to experiencing more of this when we return to Colorado with the kids. This time, we had a delicious barbeque courtesy of Slow Groovin’ BBQ from Marble Colorado and craft beer from the Roaring Fork Beer Company located in Carbondale, Colorado. There was a bit of lassoing thrown in around the campfire as well as a stunning sunset. These are the unique cultural flavours we travel to experience. I was surprised that only Laurence, Craig and myself got up early to do the hike to Yin Yang Lookout, which starts at the edge of Snowmass Village. 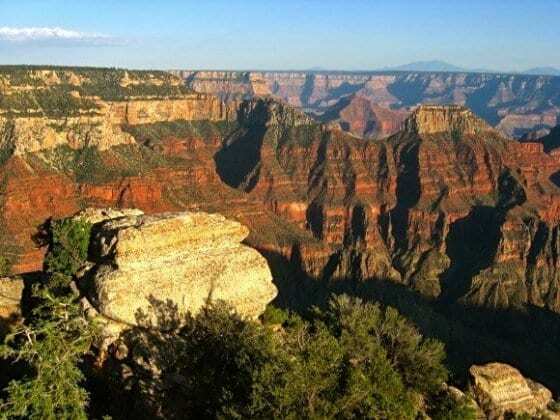 It was a quick 30-minute switchback hike which is part of the longer Rim Trail along the alpine ridgeline. It was such a great way to start the day, it shook out the hangover and energized me for the rest of the day. The Yin Yang Lookout offers incredible 360-degree views of Snowmass, Mt. Daly, Capital Peak and down on Ziegler Reservoir (site of the Ice Age Discovery). We had an enjoyable visit to the Anderson Ranch Art Gallery. I was impressed with the way this community has been created to help artists from around the world to come and hone their skills, to learn and collaborate with each other through many artistic expressions such as printing, ceramics, wood working, and sculpture. The artists come from all around the world to attend workshops and stay at the ranch and its beautiful surrounds. One of my favourite moments of the entire Snowmass trip was listening to one of The Hass Brothers, the current visiting artist, describe the intricate pattern and language system he created with the printing design. No one understood a word he said, all we heard was intense passion and joy. All I could say at the end was, “Wow. That was awesome.” And his artwork and strange alphabet thing he created were beautiful. What a way to finish off an incredible Snowmass experience by taking the Independence Pass road back to Denver. It’s quicker than the highway and far more beautiful. 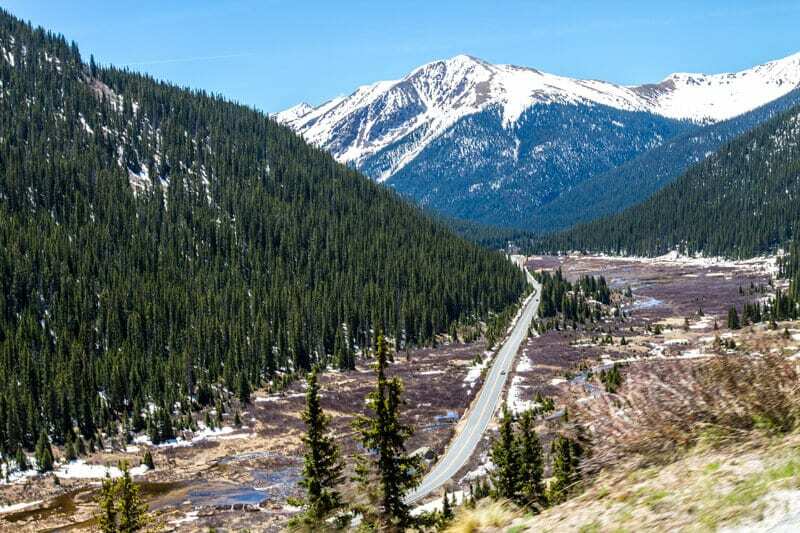 Independence Pass is the highest paved mountain pass in Colorado at 12095ft and is one of the most spectacular drives in the US passing clear rivers, beautiful valleys, steep peaks, and extensive aspen forests. 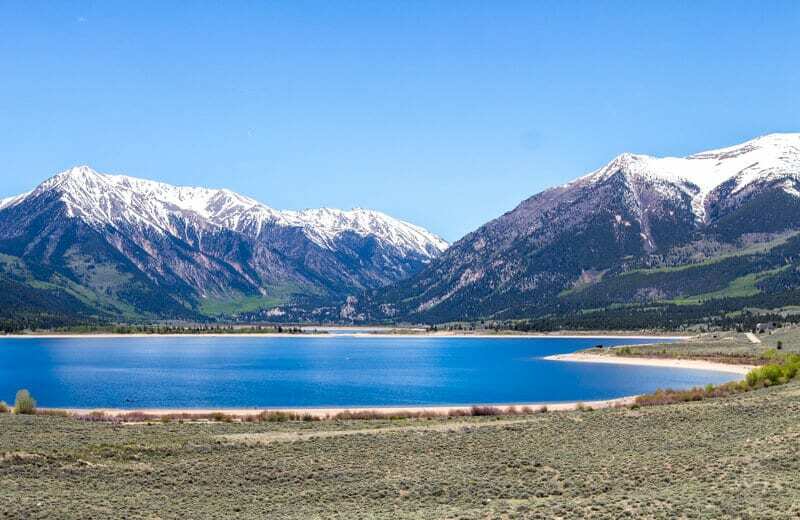 It will take you over the Continental Divide, through the US’s highest incorporated city, Leadville, a whopping 10,152ft high, where we stopped for lunch. There are plenty of places to stop along the way to take photos. 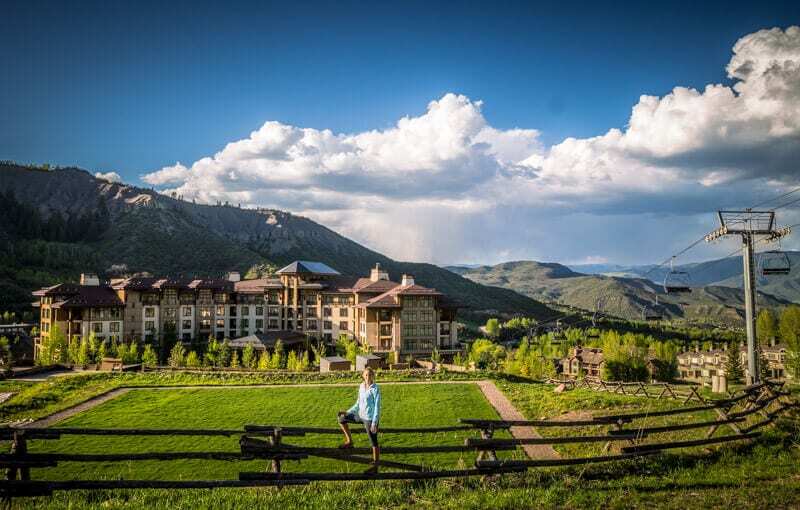 The Viceroy Snowmass is a beautiful hotel at the edge of Snowmass Village with stunning views out to the mountains, especially from their Eight K restaurant and deck. The food and service at the hotel were exceptional and the suite rooms comfortable and luxurious. It was the biggest bathroom I’ve ever seen, and I loved it. I rarely enjoy baths, but I filled this one up for a soak in some of the bath salts from the Viceroy Spa. I was impressed with the Viceroy. It would be a great place for families to stay with kitchenettes in the rooms and plenty of facilities and a great outdoor pool. It’s a ski in/ski out hotel, which I learned means you can walk out the door and straight onto the ski lifts. Booking.com rates The Viceroy as a top pick and best value accommodation in Snowmass. 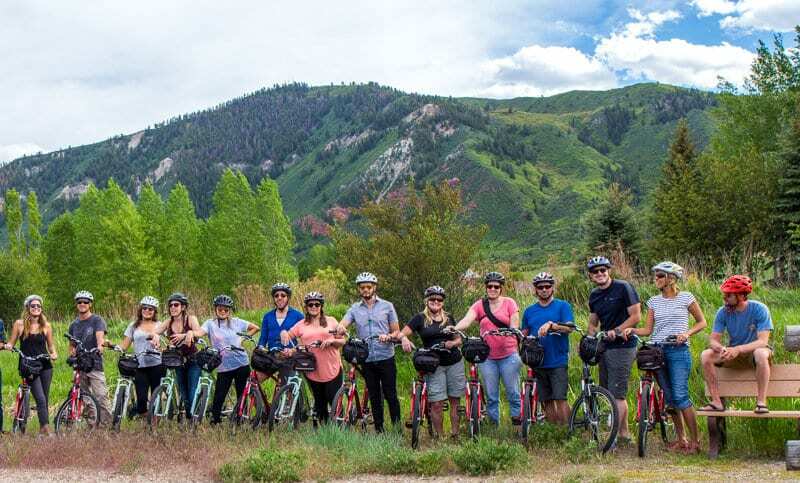 We stayed in Snowmass as guests of the Travel Influencers Summit we were under no obligation to write anything. I chose to because I loved it and wanted to share. Oh wow, this is even better than how I have pictured Colorado mountain towns to be. 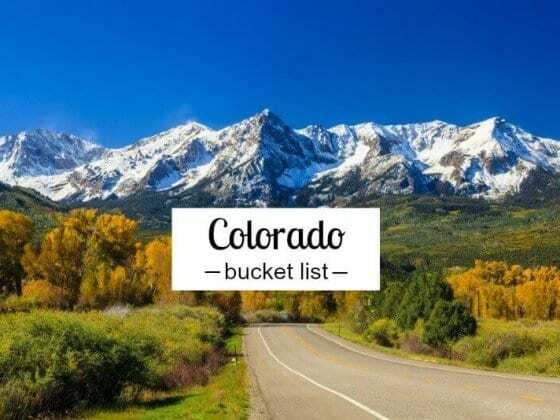 It’s been more than 20 years since I’ve been to CO and I can’t wait to go back and explore the state. And to take that drive at more than 12,000 feet! It must have been gorgeous. This is Colorado. It’s why we love it so much. There are so many towns like this that are so beautiful. 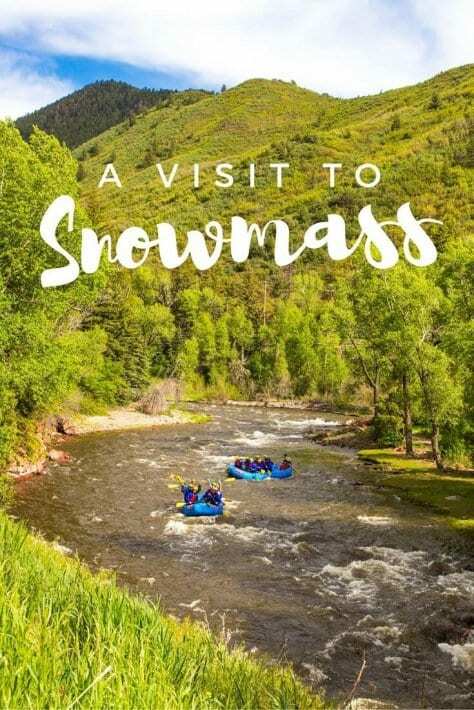 Snowmass is one of the best (we’ve seen so far) I can’t wait to see more and I’m hoping we can do a white christmas in a log cabin – my ultimate dream! Thanks for the love! It was great to spend time with you and Craig. wow! Snowmass ! This is the most beautiful mountain town I’ve ever seen. about few months ago I visited there with my family and enjoyed much. I can’t forget those gorgeous moments. It is a really beautiful place, I love nature. 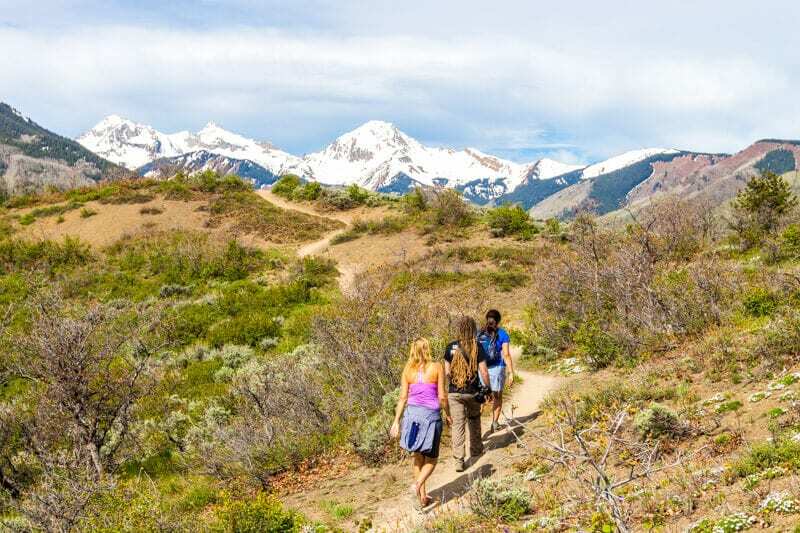 Snowmass is a good place only to adults or there are good activities to children too ? Snowmass is killer. I’m glad you guys mentioned the Yin Yang, because it’s truly a special place – meditative to say the least. 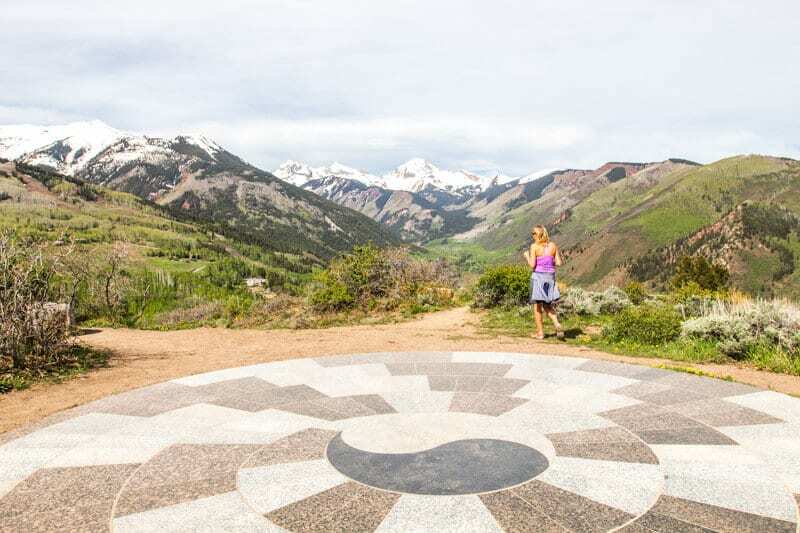 Here’s my partner’s own account of hiking up and doing a little yoga: http://www.nomadcolorado.com/snowmass-spiral-point-hike-will-steal-breath-away/. Keep up the writing! Hi there are places for recreation for kids too? the place is beautiful. Absolutely. One of the most family-friendly ski towns in North America.